ST. LOUIS -- Jaden Schwartz realizes it was just one regular season game. However, the St. Louis winger still felt plenty of satisfaction. 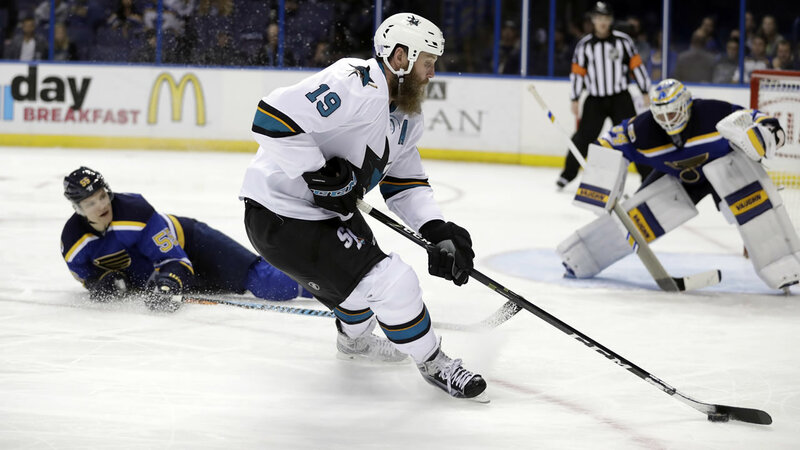 Schwartz scored twice and David Perron added the game-winner to give the Blues a 3-2 win over San Jose on Thursday night in the team's first meeting since the Sharks won last spring's Western Conference final in six games. "It's a good measuring stick more than anything," Schwartz said. "Last year, everyone is still going to remember it. You don't want to look too far behind. But they're always at the top of the standings and this is a good win for us." Jake Allen had 29 saves - holding off the Sharks' 6-on-4 advantage over the final 55 seconds - as the Blues won their second straight. "We didn't change anything in our game, we just kept coming," Perron said. "We came out hard and did what we had to do." Kevin Labanc got his first NHL goal and Logan Couture also scored for the Sharks, who lost their second straight after winning the first three on a season-high six-game trip. Perron broke a 2-2 tie with a power-play tally late in the second period. San Jose had killed off its previous 26 penalties over an 11-game stretch. Schwartz gave the Blues a 2-1 lead on a wrist shot from the high slot midway through the second period. He has five goals in his last six games after just one in the first eight. "He's shooting the puck, he's attacking the net," St. Louis coach Ken Hitchcock said. "He's getting more and more determined to score." All three of the Blues' goals came as the result of traffic in front of San Jose goaltender Martin Jones. "When we play our game, we can be successful against anybody," St. Louis defenseman Alex Pietrangelo said. "That's a good team over there and we rose to the occasion." San Jose was 0 for 6 on the power play. The Sharks had plenty of chances in the frantic final seconds. "The difference in the game was the power-play goal," San Jose coach Peter DeBoer said. "They got one and we didn't." Labanc's goal tied the game midway through the second period. "I was just kind of battling in front of the net trying to get in position for a tip," Labanc said. "But (Joe Thornton) tipped it to me and I just kind of turned around and shot it." The Blues were playing without Alexander Steen, who missed the contest with a lower-body injury.